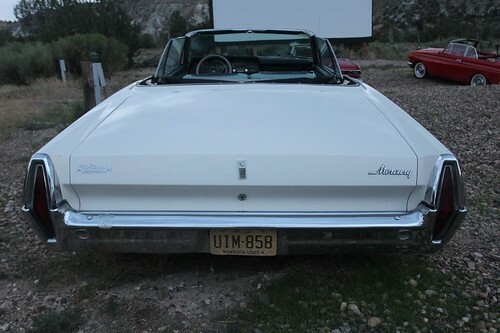 Mai Mish - Day 6: Another day in Escalante and another night at the Drive-In. 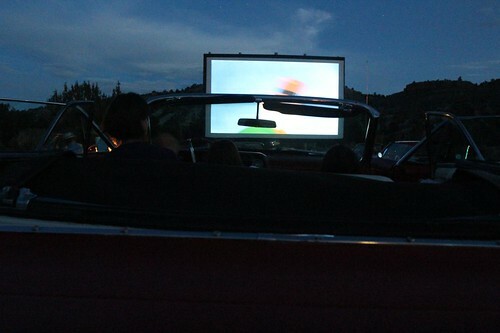 Day 6: Another day in Escalante and another night at the Drive-In. 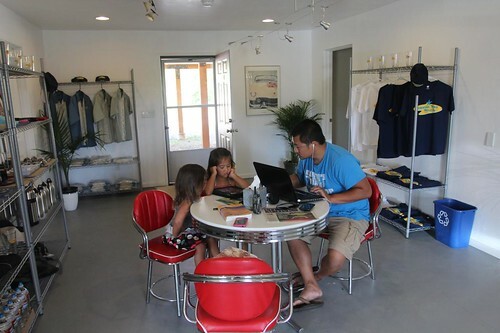 Our only full day here at Shooting Star Drive-In started with a visit to the park office to use their Internet so we can take care of some business. Mark, the owner of the resort, graciously let us take over the gift area for a couple hours while we got re-acquainted with the outside world. The office area also has 2 restrooms and one of them has a household-style tub and shower that is very clean and has plenty of hot water. Mark bought this 25-acre property a few years ago with nothing but a family of desert foxes on it and has since turned it into a fabulous resort. The amount of work that went into building this place from scratch is astounding and it is constantly improving. He was a native Chicagoan who moved to Northern California before purchasing and pursuing this dream of his here in the high desert plateau of southern Utah. According to Mark, what he misses the most by being out here is access to a decent golf course. I think he has got something cooking on the property to solve that problem soon. We headed once again into town for lunch. 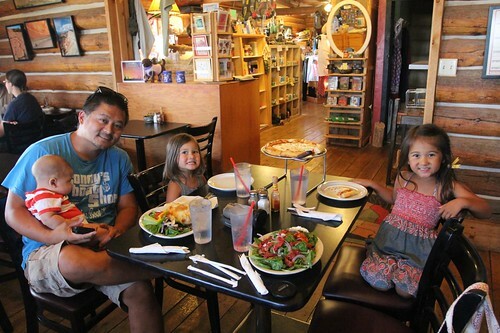 This time, we ate at the Escalante Outfitters. It sounds like a store that sells outdoors equipment, and it is, but they also happen to serve great pizza, calzones, sandwiches, salads and beers. Oh yeah, and if you need a java fix, they make a mean ‘Esca-Latte’. No joke. We stopped at the little grocery store in town and restocked our fridge with some of our bare essentials. Things like, milk, bagels and of course, candy. The temperature in the afternoon here has been up in the 90s. We have been able to do without the AC so far but we had to bust out our fan to get more air to circulate. Ava likes it because it gives her the wind-in-the-hair look. Since our phone connection has been spotty, the clock on them have switched themselves back to Pacific time. 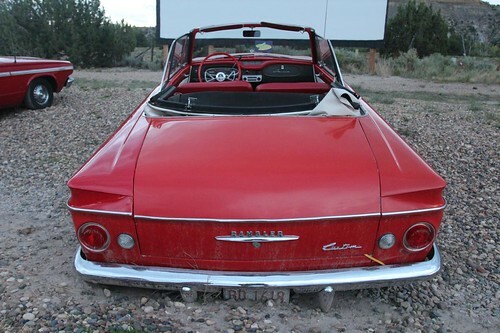 That made us miss the first hour of last night’s drive-in movie. It is the cartoon part the kids wanted to see the most. 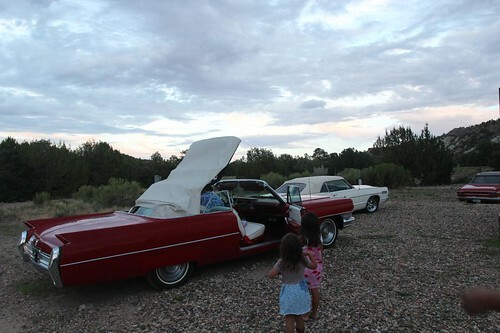 Mark plays about a half hour to a hour worth of vintage Looney Tunes just for the kids until intermission before they fall asleep in his classic convertibles. We headed out to the resort and drive-in area early to do some walking around and also to take some photos of the trailers and cars. 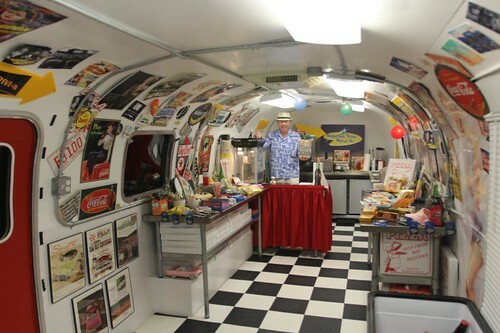 Here is a 70’s vintage Airstream Sovereign that doubles as the drive-in’s snack bar. 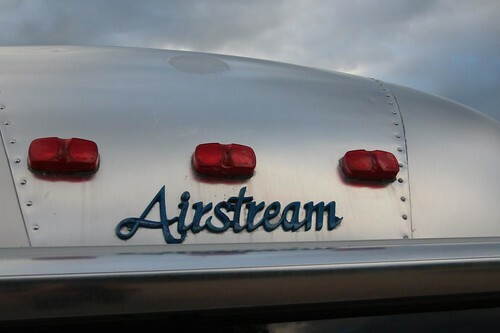 The logo that rides on the end caps of the Airstreams have changed over the last few decades. It is interesting to see them all in once place. This is a 70’s vintage logo. 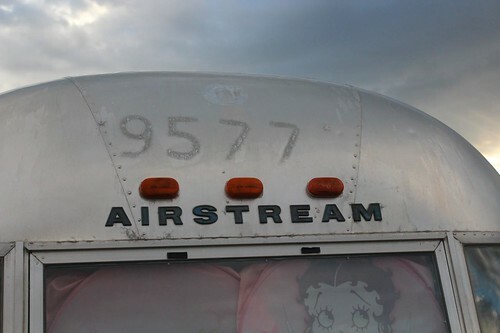 Here is an 80’s Airstream Excella with a cursive font for the logo. And in the 90’s, the logo went to a more modern italicized font. 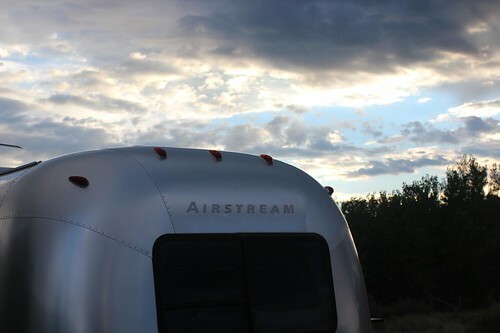 Sometime after 2000, Airstream has switched them back the the 70’s style logo that all of them are sporting today. There is a little hideout in the middle of the trees next to the first group of Airstreams. 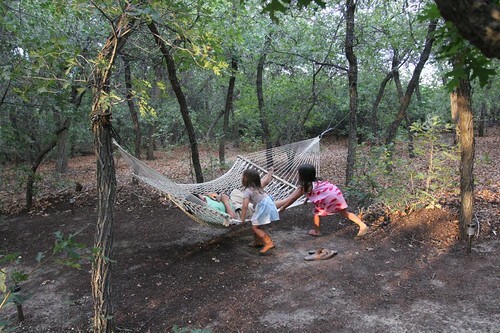 There are a couple of hammocks and a small man-made creek that flows through there during the spring. It is a great place to take a nap in a hot afternoon. That is if you don’t have kids constantly waking you up. Before the movie can start, the sun has to set behind the mountains to the west. 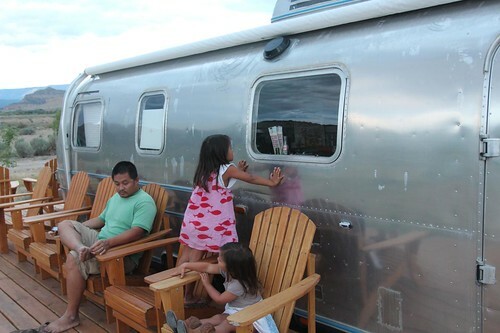 The girls patiently waited for darkness to come by staring into the window of the Airstream snack bar. 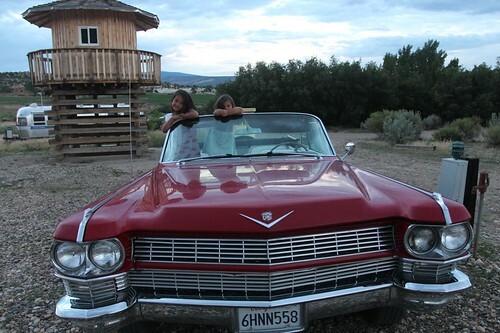 We decided to ride in the Cadillac for tonight’s movie. After the cartoons and intermission, we are watching “Pal Joey” starring Rita Hayworth, Frank Sinatra and Kim Novak. Every single one of these cars are in driving condition. They are not showroom quality as they are intended to be used but they are great drivers. The resort is only open between April to November before the snow starts to fall. During the off season, the cars are stored inside a large indoor car port near the RV campground where we are staying. 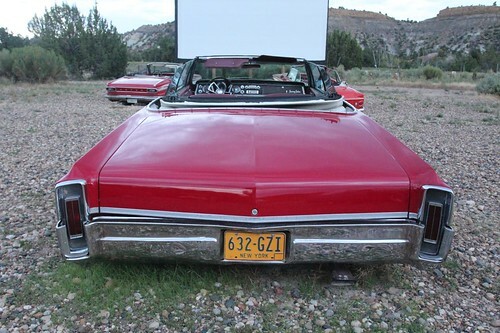 This Cadillac, Mark and his Shooting Star Shooting Star Drive-In were featured a month ago on NBC’s Today’s Show segment when they features Highway 12 of Utah and all of its attractions. 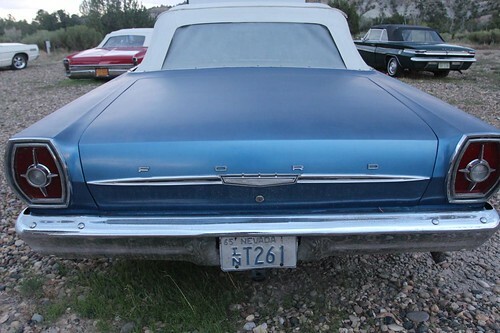 Besides the Cadillac, there is a Ford Galaxy. 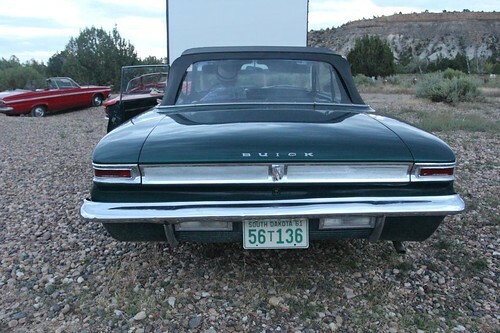 And finally, a Buick Skylark. All convertibles of course. That is Mark inside the Skylark dropping the convertible top down to get it ready for the show. The kids loved watching these vintage Looney Tunes cartoons. Cartoons today are not quite the same any more. I get the educational aspect of today’s cartoons but the old Looney Tunes are so much more fun. 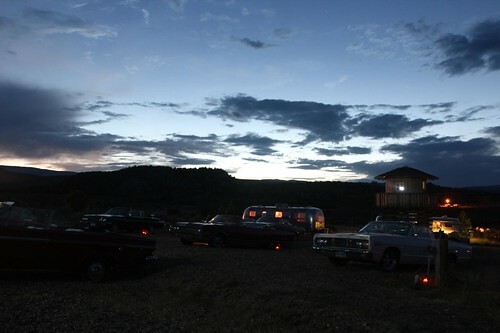 The view of the sunset behind the mountains at Shooting Star Drive-In is spectacular. As is the popcorn at Mark’s Airstream snack shop. If you get a chance to drive through Escalante, Utah, make sure you make a stop here. Your experience wouldn’t be complete a night at the Shooting Star Drive-In. 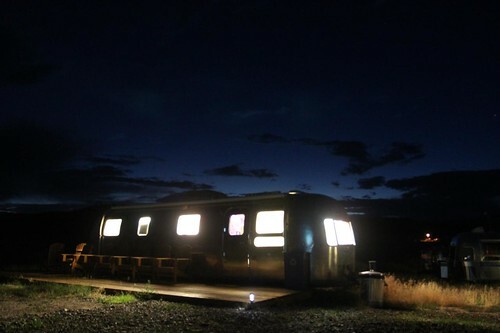 Day 5: Shooting Star Drive-In and Airstream Park at Escalante, Utah. 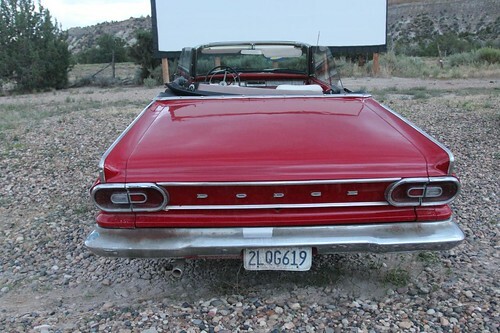 2 Responses to Day 6: Another day in Escalante and another night at the Drive-In. It looks like you guys had a great time here in Escalante. Have fun on the rest of your trip and come back anytime.